Lake Mead’s rise by two feet in May presages a total rise of 32 feet by the end of February, 2012, reported the Las Vegas Review-Journal several weeks ago. Last night at midnight, the elevation of the largest storage reservoir in the US was 1,097.89, leaving another 30 feet due for release from Lake Powell upstream. 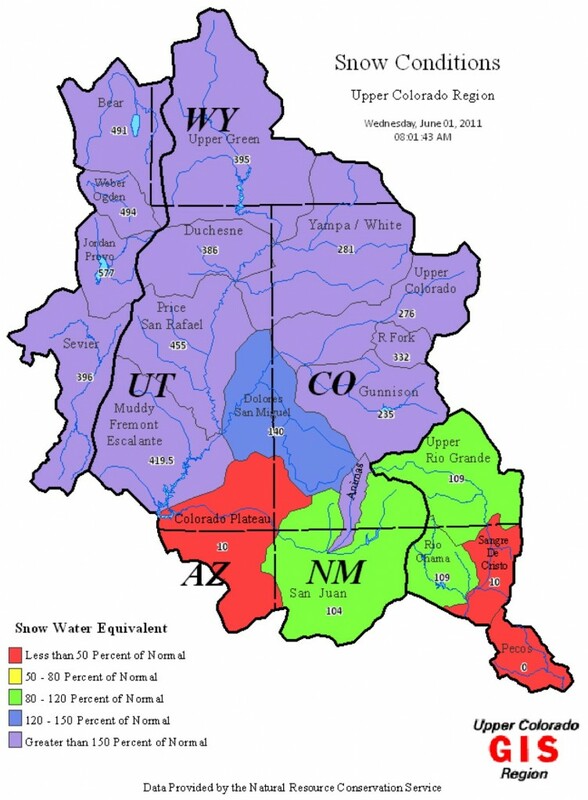 The federal Bureau of Reclamation graphic, left, shows how much water sits in reserve as snowpack in the upper Colorado region. As the snow melts and the water makes its way through the dam system upstream, the 2010-11 water year on the Colorado will push Lake Mead steadily upward from the 1,075 elevation, at which point shortages would have been declared for Arizona and Nevada. For California to be hit by shortages, the reservoir would have to drop further because of an antique priority rights system governing the river. While Las Vegas celebrated a near miss with shortages, (last November it was within 7 feet of the trigger), last week the editorial page in the Los Angeles Times urged water managers to greet the good water year conservatively as the Los Angeles City council entertains relaxing lawn watering restrictions. Click here for Reclamation records of the elevations of Lake Mead going back to its impoundment by Hoover Dam.